The Canadian dollar today rallied against its US counterpart after the release of jobs reports from both countries, which beat expectations. The USD/CAD currency pair spiked briefly after the release of the US non-farm payrolls, but headed lower shortly thereafter as the loonie recovered. The USD/CAD currency pair today dropped from an Asian session high of 1.3492 before dropping to a low of 1.3419 in the early American session. The currency pair was in a consolidative phase at the start of today’s session as markets reacted to yesterday’s disappointing US ISM manufacturing PMI data. A rally in crude oil prices as tracked by the West Texas Intermediate, which hit a high of 48.86 today, also boosted the loonie. 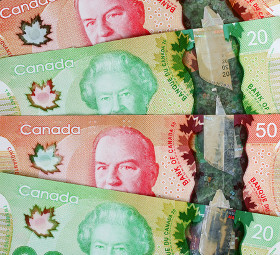 The release of the Canadian labour force survey for December by Statistics Canada triggered the loonie’s latest rally. The Canadian unemployment rate came in at 5.6%, which was lower than the expected 5.7% print. The country also added 9,300 jobs in December versus the expected 5,000 jobs, which also boosted the loonie. The release of the US non-farm payrolls data for December by the Bureau of Labor Statistics triggered the brief spike by the currency pair. The non-farm payrolls came in at 312,000 new jobs, which was almost double the expected 177,000 new jobs. However, the spike was short-lived as the loonie quickly recovered allowing the pair to extend its decline. The currency pair’s short-term performance is likely to be affected by the Fed Chair Jerome Powell‘s speech scheduled for 15:15 GMT today. The USD/CAD currency pair was trading at 1.3439 as at 14:45 GMT having dropped from a high of 1.3492. The CAD/JPY currency pair was trading at 80.79 having rallied from a low of 79.72. If you have any questions, comments, or opinions regarding the Canadian Dollar, feel free to post them using the commentary form below.